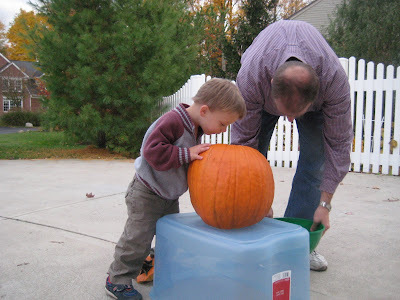 We finally got around to buying a big pumpkin to carve with the boys over the weekend. I sometimes feel like we are such slacker parents. 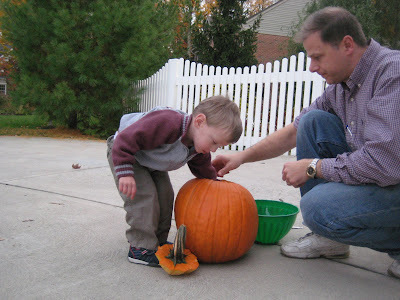 It's so hard to do the "traditional" things that singleton parents do with their kids. 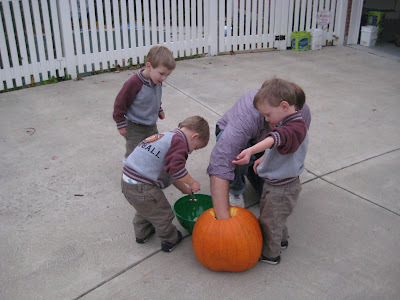 Carving a pumpkin would seem like a simple thing to do if you didn't have six hands trying to get into the same pumpkin at the same time. Why not have three pumpkins you say? Because that would need three adults (think sharp knives, pumpkin guts being thrown, etc) ... and last time I checked there was just Dan and me. I commented to Dan the other day on how bad I feel sometimes that I think the boys get shafted because we can't take the time to do one on one activities with each boy as much as we want to. He twisted this around into that I was feeling more sorry for myself than I was the boys. To which I promptly fumed and sulked because I operate under the theory that EVERYTHING I do is for my boys without any thought to myself. But he is probably right on some level. I do have a pity party for myself in regards to the boys every once in awhile. I think every parent of multiples has those times when you think what would it be like to have just one baby at a time. Just one baby to nurse ... to hold ... to share adventures with ... to read books with. Having multiples of the same age is very different than having multiple children of different ages. All three of the boys need the same kind of attention and time commitment NOW! With different ages, I would suspect that you could give attention to the younger one while the older one plays independently ... and conversely, while the younger one naps, it is the older one's turn for attention and one-on-one time. That's the kind of set-up that makes me jealous -- even angry -- sometimes. Yes, we take the boys out individually and have "Mommy Time" or "Daddy Date", but it is not the same thing. One or two hours of alone time does not make up for the countless hours where they have a three-way fight for attention. But this worry is probably all in my mind. The boys seem to be okay with sharing Mommy and Daddy. They even take turns sitting on our lap while reading books. The other night after I finished a bedtime story with Hayden, he got off my lap and proudly said, "Noel's turn!". I love that they share and take turns. I know exactly what you mean! We have this big recliner I sit in every evening and all three of the boys climb on my lap and drink their milk...they won't all three fit much longer and it makes me SOOO sad! 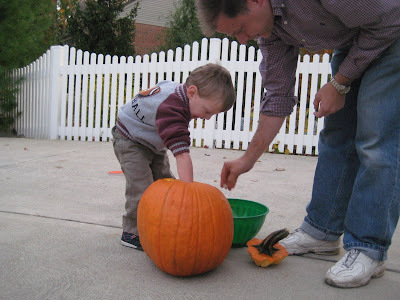 We also only carved one pumpkin. The boys fed our dog some of the pumpkin guts while Sean laughed and I freaked out...we ended up having a pile of dog vomit in our basement...YUM!